A few years ago I was dating a realtor that assisted in the sale of a house in Northern Kentucky (not exactly home to legendary producers) that had a pretty nice home studio. The woman could not remember the name of the person that bought the house but told me he worked with “some bands from Europe”. I eventually found out his name, Erwin Musper. I also found that those “some bands” were Def Leppard, Iron Maiden, The Scorpions, Van Halen (all 3 singers), and Metallica. 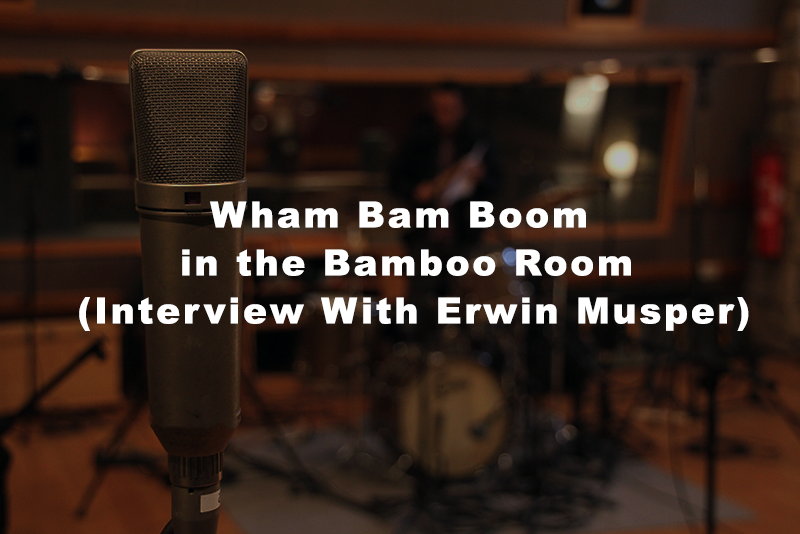 After a 18months of remodeling and extensive use of eco-friendly bamboo through out the studio, Erwin still works with those “some bands” as well as unsigned bands in what he appropriately calls, The Bamboo Room. Here he shares a little one on one insight into the difference between engineering and producing as well as the Karmic value of working with new bands and the sonic sculptures of “some bands” like Van Halen and Iron Maiden. Do you consider yourself more of an engineer or a producer? For me it’s both. If I’m producing I’m also engineering. Actually I don’t even remember producing without being the engineer as well. Sometimes I’ll get a mixing job where I’m just the engineer or the mixing engineer. These days they intertwine. You make a lot of decisions as an engineer that end up really being a staple on the final product. So you’re producing and engineering as well. It’s a fine line. Since you have your own label, tell me a little bit about your label. The whole thing started out as a pleasant surprise when I moved here. I moved to Cincinnati (actually northern Kentucky) from Hollywood without knowing anything about the city or the region. In Hollywood I never thought about setting up a record label because I have to say I didn’t find the music scene in Los Angeles that interesting. Everyone who had moved there had already established themselves as a major player so when I worked there it was always with people who had major label contracts. When I went to clubs I mostly saw people trying to do the same thing so it was not original. When I moved to Cincinnati I found it has a fantastic pool of talent! So many original bands. Everybody was doing their own thing and I got inspired by it and rejuvenated. So I thought, you know what, if I have my facility here, in between jobs for other people, why would I leave it unused? So I thought it would be a good idea to help the talent here and bypass one major hurdle they have…the absence of a recording industry in Cincinnati. Everyone knows how to play their instrument but they don’t know how to make a record, get it out there, and take the next step to benefit their career. Do you approach working with a band on your label differently than a band that’s not on your label? No, no no. I would approach a band that comes in for the first time or just came in for cutting drums, they deserve as much respect and professionalism as the biggest band out there. You are dealing with something where they want to do a great job with their product so you should be aware that your part in it is just as important as your part when you work with Van Halen. They want to do a great job. A local band, why would you want to treat that any different? The only thing I have to accept is that with Van Halen, you spend, let’s say, three months on a drum sound. In my occasion over here, you have an hour (laughs). But, if you know how to do it, an hour could be enough. I see that every client deserves the utmost concentration and help. They should leave with a smile on their face. I couldn’t do it any less. How can you measure, “ok, I’ll give 80% today”. It’s impossible. What about dealing with a younger less experienced band versus someone like Van Halen who obviously have had a lot of experience. What I do is, in that is a contrast to what a regular studio does, before someone comes in here, if I’ve never heard of the band, I wanna know what their kind of music is. I’ll go on their social pages and check out their demos. If I feel we might run into a problem in the studio, let’s say, you really hear fluctuations in tempos and all that, I tell them, before you come in and book the studio, come in and sit with me for a night and we brainstorm about how your first professional studio time should be used. Then I tell them the pitfalls and priorities you should set for a successful session. So the first few hours in here is mainly mentoring. Then they go home and they either accept it or…I’ve never heard seen anyone say “thanks but no thanks”. I want to know that whoever comes in here justifies their budget, even if it’s not “their” budget. It’s not really creating a lot of income (working with younger bands) because if you have a band that comes in for a weekend but you spend a day prior to that without being paid telling them how to prepare for the weekend, you’re not really making money. But, I feel you could say this is a selfish reason, I REALLY like where this music generation is going and I want to be a part of it. That’s a selfish reason. I feel that even with the younger generation that goes it’s own way musically, they can benefit from my knowledge. No one has a bad session. You learn so much from being in here (big studio) much more than at home with their thousand dollar recording machine making one mistake after another and they don’t know cause no one is telling them. You can’t ignore phase problems with the drums or print a heavy reverb with your guitar and regret it later. I love working with young bands because they are more receptive to guidance and new ideas and I learn from them because when a young kid comes in with a great song, that’s the best thing that can happen! Yeah, but I’m not going into the musical aspect of it if I’m not the producer. If they have a song, I’m not telling them this is a better song. I will tell them how to get that particular song on tape, the best they can, within the budget. But I’m not telling them you would be better off changing the key or taking out this. Because, that’s not my job and I would feel I interfere with them or maybe some people might be intimidated because they have heard of my background. I just want to get their productivity up. But, if they ask me for things, I’m not saying that’s not my job. If they ask, “what would you do?” I will tell them but I will also keep in the back of my head “ok, if I’m going to tell them to re-write the chorus” we can’t do that between 8 and 11. I would tell them afterwards and say, “ok, you got this and this and this, if you ever go back into the studio, think of these points”. It’s a little bit of guiding along the way. You mentioned priorities, what would you consider the priorities for an “ideal” session? drums and bass and you guys, when you do harmony vocals, just do it with an acoustic guitar and listen to it because it would be even better if you synchronize your breathing or timing. You can (then) say to yourself, “we made our record, all we need to do now is record it” because everything was prepared. Let’s say you have a band coming in that says “we only have a budget of 10 hours to do one song” but we want to have the best product so we can shop it”. How would you allocate the time? Do you have a certain approach or do you just start doing it and see how it goes? Let’s say if they have a day to do one song, I know by heart how much time the maximum time is you can spend on a drum take. What I always tell them is this, let’s spend 7 hours instead of 10. You go home with a rough mix, live with it for a day or two. When you come back you say “oh I wanna redo that line and this and blah, blah, blah”. You spend another 30 minutes on the things you slept on, and then you mix for 2 hours and you still have a half an hour left, take it home. So I would say if you have 10 hours, don’t use it in one block. Before we start talking about the “Big Names” you have worked with, any last bit of advice for younger or less-experienced recording musicians? Don’t dwell on something that is killing your momentum, killing your adrenalin. Use all the energy you want to put into something into the next song. Some producers, simply replicate sounds, some try to enhance the sound of a band, and other write with the band, almost like another member. Do you get involved much in the writing process with the bands you work with? I’ve worked with bands that we knew OK, this is going to be another million seller, we know that because the last 10 were million sellers and I was part of 5 of them or something. When I’m being hired as a producer for any band, I’ll go in and spend a tremendous amount of pre-production. I’ll go in and sit with them in rehearsal space and dissect the songs. Totally! We’ll set up tempos, different keys, a lot of times I have about 40 or 50 songs as a demo on my desk before I even go over there. I’ll go through them and pick my 15 favorites or something and tell them, OK, here, his song is really great but you have weak bridge and this a not so great song but a tremendous bridge and I was able to get that bridge into this song, what do you think of it? That is producing. Chord changes that I think, well, if you make this third line a different chord change it’ll lift, I’ll go into that. It’s very much a musical contribution when I’m producing. I do that the same with a young band as with an established band. Some engineers and producers are known for “niche” type sounds or projects. You’ve worked with everybody from Iron Maiden to Paco DeLucia which is quite an extreme range, other than the obvious sonic differences, how do you approach projects drastically different like that? I never go in and try to put my stamp on it. It’s easy to go for the same drum sound every single time but even if you have a procedure of getting drum sounds it’s totally different with every drummer. I have a house drum kit in here that is always set up and it guarantees me a basic great sound but it is never the same! I think last year I had 10 full albums with that drum kit and I had to treat it differently every single time because of they way the person behind it was playing it. It is SO much different that if you think I’ll put the room mics here, it should sound like this and the next guy comes in and the whole room is different. So you have to just take the starting point as the same. Say the close miking and how many mics, but re-adjust it for every single guy. Mainly for the room sound, the balance. Some have a lead foot so it’s always a BIG kick drum and the other ones are more playful. That’ll change it a lot. So the end result is, it will sound different. I go in there (the room), I listen to the drummer and find the exact spot where his drum kit is totally in balance when he plays the way I want to hear it in the mix. If I put my room mics right there and I go back into the control room, and I just push up the stereo faders for the room sound, and I feel “that’s it!” I know I have won. If not, then I have to do it artificially. You know, you have trouble with a drum sound and you pinpoint, a little more here and this there and you keep riding the faders til you’re happy, it’s un-natural. It should be in the playing. If you have a talented, professional drummer you’ll find the spot and every mic could fail except the room mics and you still will have a great sound. If you go and look at how Led Zeppelin or Deep Purple (recorded), I think they used 3 microphones and it never bothered me (laughs). Going back to the idea of doing that and just compliment with the technology of today, I think that’s the approach. But, if you go to the young engineers that have never heard of acoustics and are just setting up the drum sound, the first thing they’ll do is, OK, the kick, BOOM! BOOM! Now the snare…that’s not how you set up a drum sound. You start with your overall sound. It all goes back to how experienced you are as an engineer. The old school engineers, the people who grew up in the analog days are getting less and less. The young kids that start (recording) have never experienced the challenges of making a good record in those days. I was walking around with feet and feet of 2 inch tape around my neck because OK, I got this splice with the razor blade and a chalk and I’ll take this bar out take it from another take so everything was spliced up and if you make a mistake, you’re in big trouble (laughs). Now everything has an undo button. You go into a different studio and it will be an even bigger thing. For example with The Scorpions last album I did in 2004 or 2005, I was working in Germany and I set up 2 drum kits in totally different parts of the building and we switched from one to another in the SAME SONG! You know the intro and back to the verse in the studio that was only 500 sq. ft. and the chorus in the big hall and it worked FANTASTIC! Was that just to give the drums different dynamics? Yeah! As soon as everything got the euphoria, the drums did the same thing and it worked! It was still organic. The same thing with Van Halen. I did that a lot. I had 3 sets of bass amplification and we switched in between sections of the song. This one was with this head, and this one with the same head but with the extra speaker etc. It’s all color and if you do it organically, you don’t even notice. I learned so much from Mutt Lange. I was even thinking today that whatever Mutt was trying to achieve in those days, someone must have been there as well because whatever Pro Tools can do these days it’s all catering to what he wanted 25 years ago. I remember I worked with him from 84-87 on the Def Leppard album and he wanted to do all that and now you can just do it on Pro Tools. I had a MAJOR MAJOR thing, he was in the hospital, he broke his knee cap in a car accident and I visited him and he asked, “can we get the board in here” and the doctor said “nooo nooo nooo” (laughs). So he asked me, “we have this song, “Pour Some Sugar On Me” and we’ve already done vocals, all the backing vocals, bass, and drums and I want 8 bars extra in the 1st verse”. You know with Pro Tools it’s “click-click-click.” Not with about 72 tracks of analog. He asked me to do that while he was in the hospital and I know him, he would know if I would have been one millisecond off. So what I did was I had two big SSL consoles next to each other and three 24 track machines and I kind of off set the first 2 multi-tracks by exactly 8 bars with a Lynx synchronizer and when it was time I switched the 2 consoles while I was recording their outputs onto third multi-track so I created 8 more bars. That was something SO elaborate, it took me I dunno, two days to do that. You’ve also worked with bands that were well established before you came onboard. How do you go about capturing THAT bands sound and or help them to either re-create that and/or enhance that sound? Well, let’s say Eddie Van Halen, when he plays, you will know. It’s so unique. When I got on board, I had to call my friends from The Scorpions to fly in a very high-end splitter box that I used with them because Eddie had never played with more than one amplifier. I said, “let’s set up three!” But, we can not afford to loose the signal. Normally with the old time splitters you loose everything. There is no sustain or anything. I had found a guy in Vancouver who built perfect, perfect splitter boxes. But it would take six months. But when I was working with the Scorpions in Vancouver, they had bought two so I knew Rudolf had a spare one. So I asked him if he would send one over to help with Eddie. So, for the first time he had his 5150 and two Marshall’s set up and he loved it! So that is my contribution. If you listen to the Balance album and the one before, you definitely hear a richer guitar tone. What about Steve Harris’ bass tone? He’s got a great bottom end but the click that cuts through. Although it has differed slightly from album to album, it is still HIS sound. I think he went through 3 sets of strings before the song was through. You know how new Rotosound strings sound? They would last a verse in their opinion of how perfect it should be. That was definitely something that led to that sound. Those strings were never older than an hour (laughs). Also you had these 8×10 Ampeg cabinets (SVT) and in the middle there was a little tweeter. I always put an SM57 there and I put it on an extra track. I had 4 tracks if I remember correctly. I had an Electrovoice RE 20 on the 18 inch speaker, an AKG D12 on the 10 inch speaker of the SVT, an SM 57 on the tweeter, and I had a D.I. What I love to do when I’m mixing is play with them through the song. Whenever you need that little extra of anything, instead of coloring it with EQ, just change the balance of those 4 tracks. 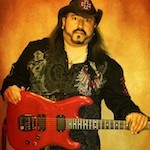 You’ve worked with Van Halen with all 3 singers, what is it like working with the same band with 3 different singers? Three totally different personalities. You gotta get on tape what you gotta get on tape. It’s mainly dealing with the characters to get them to perform. I was always happy if I had the singer in the studio just by myself. I got along with everyone even with David Lee Roth. I thought he was fantastic! When he was briefly in the band for the “Best Of”, he asked me to produce his next album. They all came in really really prepared. It all was a little bit depending on Eddie’s mood. If Eddie was in a good mood, things went better. If he had his moments, he would not like anything that was done. He would sometimes ask me to erase it without even listening to it. You always had to deal with the band as a whole. Especially with Van Halen we were in their home studio. Eddie lived literally 300 hundred feet down and he used his Ferrari or a Mercedes to drive up…never got it out of 1st gear (laughs). For them, they were there all the time. You’re hired by them so you do whatever they want. In the end, what makes the band happy, happens. I have about 3 or 4 hours of demos that no one will ever hear. They gave it to me and said, “you know, what would you pick as your favorite ones”. And I said…this or this” and they asked me why did you pick that and I would say cause I think this is the most commercial element of your music. Then they would say, “OK, that’s NOT what we’re going to do!” (laughs). How did having 3 different singers play into their sound? Even though it’s the same band, it sounds like 3 different Van Halens. Still the vocalist because each one had a different range and that fills the spectrum quite a bit. If you listen to Sammy Hagar’s voice just isolated, if he sings one note, you will hear 3, 4, or 5 notes. He has this thing in his throat that, I don’t know how to explain it. It has a upper and a lower harmony thing in his voice so it fills up. You mix him totally differently. With Dave it was more the classic thing, it’s easy to do, because it’s a wailing voice. With Gary it was not as powerful but he had a lot more musical inflections. It would say I should mix this more as a beautiful thing than just for impact. So it is definitely the element of the vocal style that will impact the philosophy. But that’s going from the band they were, almost like “this is what we do live, let’s do it in the studio”, when the solo hits, there is no rhythm guitar. That was abandoned after a few albums with going to multiple amps and all. That changed the sound as well. They were Led Zeppelin freaks. Everything was “listen to this Zeppelin”. They insisted I had to buy the whole collection of Led Zeppelin before day one in the studio (laughs). We got close to a Led Zeppelin drum sound because that’s what they wanted. As soon as Eddie came and we built his guitar sound, that drum sound was not the same anymore. You think, OK we didn’t get the drum sound right but, if you go back to Led Zeppelin, you’ll find that their guitar sound is tiny. You just never think about it. That gives room to the drums. It’s all balancing. You have to compromise or prioritize and in the end, why would Van Halen want to be a clone of Led Zeppelin? They were just their all-time heroes. Mine were The Beatles.